Up (styled as UP by EL AL) was a low-cost airline brand of Israeli El Al. El Al announced in January 2018 that UP will cease operations in October 2018 to be remerged into El Al. On 26 November 2013, El Al unveiled its new low-cost airline Up, which commenced operations on 30 March 2014, initially to Berlin, Budapest, Kiev, Larnaca and Prague using five Boeing 737-800s transferred from the El Al mainline fleet. Up was founded by its parent El Al to be used on some routes to Europe where it replaced El Al itself. All flights of Up are operated by El Al, using El Al's call sign and codes with a four digit number. For flights over two hours the airline offers a buy on board service. In January 2018 it was announced that El Al were to discontinue the Up brand. Up was planned to cease operations by October 2018 and all flights and aircraft would return to El Al. El Al therefore introduced a new fare structure to replace the Up offers. The last flights took place on 14 October 2018. ^ "Low-cost airlines welcomed to Israel | News". Breaking Travel News. Retrieved 2014-07-18. ^ a b c d e f Elis, Niv (2013-11-26). "El Al starting low cost airline". Jpost.com. Retrieved 2014-07-18. ^ Elis, Niv (2013-11-26). 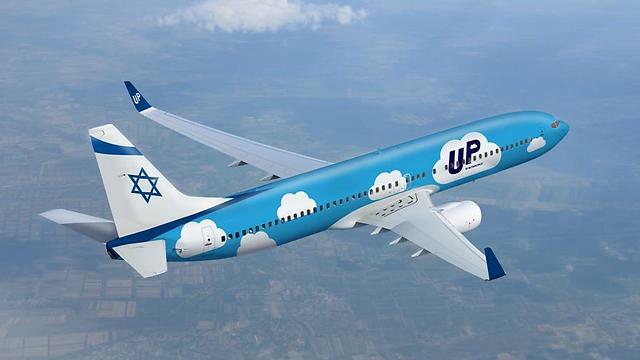 "El Al launches low-cost carrier 'Up' | JPost | Israel News". JPost. Retrieved 2014-07-18. ^ "Contact Us." Up. Retrieved on 23 April 2014. "Address: EL AL Israel Airlines Ltd. Customer Care Department POB 41 Ben-Gurion Airport, 7015001 ISRAEL"
^ "UP livery on a 737-800". Retrieved 2014-07-18. ^ "Menu" (Archive). Up. p. 5/5. Retrieved on 21 August 2014. ^ a b c d e f g "UP reservations page". Retrieved 2017-04-23. This page was last edited on 11 November 2018, at 15:09 (UTC).